Summary. 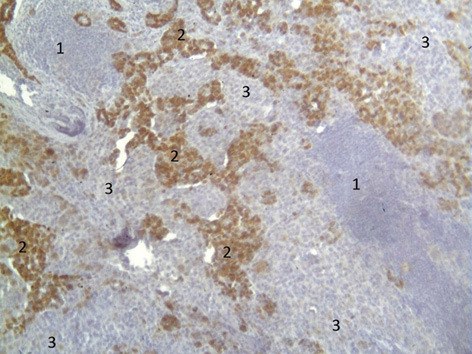 This case report describes a rare clinical condition: metastasis of synchronous multiple primary tumors — skin melanoma and breast cancer in one axillary lymph node, confirmed with the results of clinical, morphological and immunohistochemical study of surgical material from 40 year-old woman. Abbreviations used: ER — estrogen receptor; MPMT — multiple primary malignant tumors; PR — progesterone receptor. According to the numerous clinical studies, multiple primary malignant tumors (MPMT) are described as an independent appearance and development of two and more neoplasms in one patient. For the first time the definition of MPMT was provided by Billroth in 1869 who presented the following criteria for MPMT diagnostics: the tumors should be of different primary localization and different histological structure, while each tumor should develop its metastases [1–3]. I.e., a principal requirement for MPMT diagnostics is the difference between histological structure of the tumors. At present time differential diagnostics is based on the use of immunohistochemical methods and methods of molecular biology that allow to reveal the principal differences between morphofunctional characteristics of the tumors [4, 5]. By the time of tumors appearance, MPMT could be described as synchronous tumors (developing simultaneously or in 6 months after diagnosis of the first tumor) or metachronous tumors (detected after different periods or 6 months after verification of the first tumor). By clinical obsevations, metachronous tumors occur more frequently than synchronous. Also, there are such groups of tumors as synchronous-metachronous and metachronous-synchronous. Time interval that serves as the criterion of synchronicity and metachronicity, is conditional as far as the rates of tumor growth vary and depend on their localization, histological structure and reactivity of the patient’s organism . A special attention in the studies of polyneoplasms has been focused on simultaneous involvement of functionally dependent (esophagus, stomach, intestines) and hormonally dependent organs and systems (thyroid gland, mammary gland, uterus, ovaries, adrenal gland, prostate). Along with this, it has been established that multiple tumors are often localized in functionally or hormonally unrelated organs and systems, creating a group of non-systema­tized tumors. For example, in women the secondary tumors of stomach, ovaries, intestines, skin, thyroid gland develop after breast cancer . Along with accumulation of clinical data on MPMT there have been done some attempts to assess the real frequency of multiple cancers. Back in 1926 G.G. Nepryakhin has collected the data of world literature and classified 487 MPMT cases revealed during post-mortem examination of cancer patients . Higher frequency of MPMT detection at present time could be explained by several factors: a) better tumor diagnostics with the use of new methods for patient’s examination (endoscopy, ultrasound diagnostics, computed tomography, magnetic resonance imaging, positron emission tomography; immunoenzyme assays, immunohistological, molecular-genetic methods for analysis of surgical material); b) the tumor development could occur as a consequence of cancer patients treatment, especially young patients, with the use of chemo- or radiotherapy that could exert mutagenic influence on the cells; c) environmental hazards, working conditions, immunodeficient state, hereditary factors (Lynch syndrome, Gardner syndrome). An analysis of clinical data shows that probability of the development of the second tumor increases if the first tumor has been found in the patients at relatively young age [6, 7]. The difficulties in MPMT diagnosis are that multiple neoplasms do not present clinical symptoms typical for each tumor. In some cases clinical features of both tumors could be completely absent or clearly detected, in other cases one tumor manifests itself by expressed symptoms, while the signs of the second one are weakly expressed or “masked” by noncancerous pathologies. In such cases it is difficult to assess the true character of the pathologic process. Complex diagnostics of MPMT and insufficient knowledge of this cancer type could lead to incorrect interpretation of the data obtained during clinical examination of such patients. The major cause of diagnostic errors is that sometimes after detection of the first malignant tumor one could underestimate the probable existence of the neoplasm of other genesis and don’t perform an accurate examination of other organs and systems . As far as there are none objective clinico-laboratory tests and symptoms for MPMT detection, a reliable diagnostics could be achieved through complex approach [3, 9]. This article presents a clinical case of metastasis of two malignant tumors in one lymph node. The lite­rature search has revealed no reports on metastasis of two tumors of different localization and histoge­nesis in one lymph node, therefore the clinical case described below could be of interest to clinical oncologists. Patient А., born in 1976, has been hospitalized in Transcarpathian Regional Clinical Oncologic Hospital (Uzhhorod, Ukraine) from November 11, 2015, till December 02, 2015. She has appealed to oncologist with the complaints concerning skin neoplasm in the back traumatized 2 months before. Menstrual function within normal. Two deliveries, no abortions. According to the patient, there were no episodes of cancer and its surgical treatment in the close relatives. Allergic history of the patient unremarkable, she denies any venereal and infectious diseases. The patient underwent complex clinical and laboratory exam with the following results. Complete blood count: erythrocytes — 4.75•1012/l; leucocytes — 10.0•109/l; platelets — 489•109/l; hemoglobin — 141 g/l; monocytes — 0.61•109/l; lymphocytes — 0.62•109/l; neutrophils — 8.77•109/l. Biochemical blood assay: total protein — 71.0 g/l; urea — 7.5 mMol/l; creatinin — 114.0 mMol/l; glucose — 5.0 mMol/l; alanine aminotransferase — 31.0 u; aspartate aminotransferase — 32.4 u; total bilirubin — 15.7 mMol/l; conjugated bilirubin — 3.9 mMol/l. Clinical urinalysis: urine is light yellow transparent, pH — 6.5; specific weight — 1020; ketone bodies — 1+; leucocytes — “−”; erythrocytes — “−”; protein — “−”. The conducted multislice computed tomography revealed in lower-outer quadrant of left mammary gland a neoplasm with a size of 2.5 cm with pathologic tissue density and irregular contours, without microcalcinates. In left axillary region — lymph nodes with a diameter from 5 to 28 mm, in right axillary region — lymph nodes with a diameter up to 10 mm. Right lung — volume preserved, pneumatization satisfactory, lung picture enhanced, allowing to differentiate small 3–4 mm lesions of median intensity, requiring monitoring. Left lung — at the background of irregular lung picture small 2–3 mm lesions, suspected metastases. Liver is somewhat larger by right lobe. Gallbladder deformed, without concrements, with inhomogeneous content. Pancreas is diffusely dense, without cysts and pathologic lesions. Para-aortic lymph nodes are not enlarged. As far as multislice computed tomography has been performed, the patient was not examined by mammography. Clinical exam of the patient has revealed a skin neoplasm on left scapular line, with a size of 4.0 × 2.5 cm and irregular dark-brown color, tuberous, without signs of subcutaneous tissue infiltration and without ulceration. The oncologist has prepared an imprint of this neoplasm on glass slide for cytological analysis. Cytological diagnosis: melanoma (conclusion № 24678 from November 12, 2016). During clinical exam there was also revealed a tumor-like neoplasm in lower-outer quadrant of left mammary gland a neoplasm with a diameter of 2.5 cm and enlargement of axillary lymph nodes up to 2 cm. The neoplasm in her left breast the patient has explained by the trauma that occurred few years earlier. Clinical diagnosis: dorsal skin melanoma T2N1MX, clinical group II. Suspected breast cancer T2NXMx. The patient provided the permission for the removal of dorsal skin tumor and axillary lymph nodes, but did not permit biopsy and removal of breast tumor.On November 12, 2015, the patient underwent radical excision of dorsal skin tumor along with sinistral axillary lymph node dissection. Pathohistological study of surgical material №19506–8/2015; 19509–12/2015: from 16.11.2015. 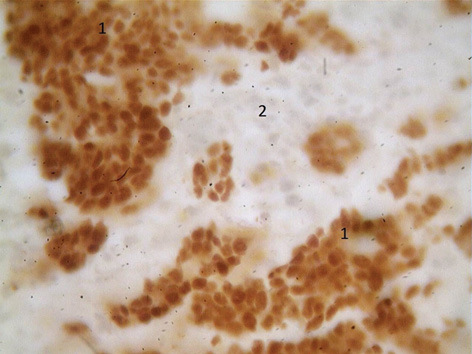 Macroscopy: on skin graft — exophytic neoplasm, on wide pedicle, with a size of 5.8 × 4 × 1.2 cm, on incision — of white-gray color with inclusions of black lesions. In adipose tissue from axillary region was studied separately, there were detected 5 nodules with diameter ~ from 0.4 to 4 cm, on incision — of white-gray color with inclusions of black lesions. Microscopic exam: exophytic skin tumor — melanoma from epithelioid cells, without ulceration, with moderate mitotic activity, moderate pigmentation, weakly expressed lymphocytic infiltration of stroma; III degree by Clark’s level of invasion, tumor thickness by Breslow’s scale — 1.6 mm, satellites in a range of 2 cm from the primary tumor not detected. 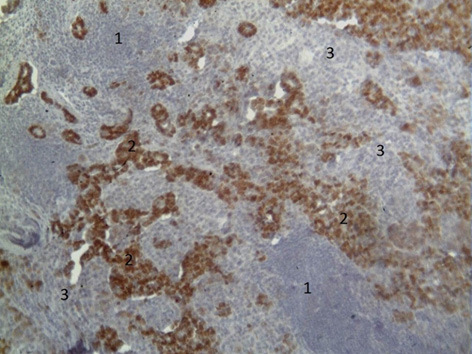 In 5 lymph nodes there were verified melanoma metastases from epithelioid cells with moderate pigmentation and moderate mitotic activity, in one from them — melanoma metastases together with з metastases of adenocarcinoma (Fig. 1, 2). Histochemical Perl’s reaction conducted on histological slides of the surgical material was found to be negative thus supporting the presence of melanin in the cells. 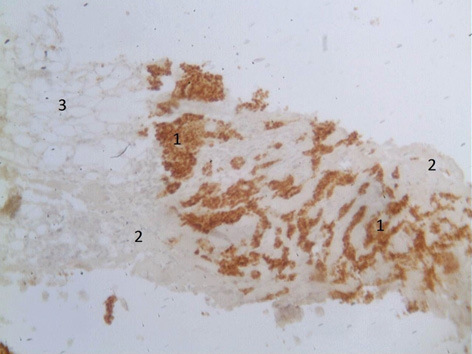 When the results of histological study of the skin tumor axillary lymph nodes were collected, the patient underwent core needle biopsy of tumor-like neoplasm in lower-outer quadrant of left mammary gland. 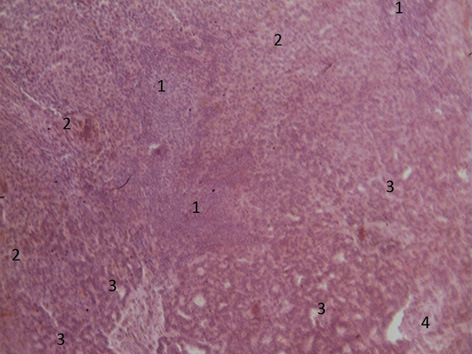 Histological study from November 17, 2015, № 19749–50: invasive ductal cancer G1 that is analogous by its histological structure to the carcinoma in the lymph node. 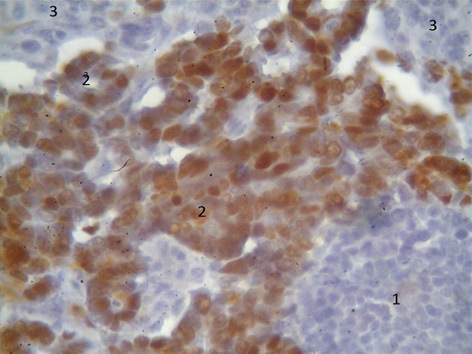 Immunohistochemical study of the breast tumor has revealed strongly positive expression of estrogen receptors (ER) and progesterone receptors (PR) (Fig. 3–8). The patient was assigned to the course of dacarbasine (1660 mg) at monochemotherapy regime, and hormonal therapy with letrozole. At the next patient’s exam it has been found that in the area of postoperative cicatrix there appeared a perforation up to 0.5 mm. A newly performed multislice computed tomography has shown the following: in skin derma in the area of postoperative cicatrix there was detected an area of pathological density up to 0.5 cm. In left breast two heterogeneous dense areas with the diameters of 21 and 24 mm in upper and lower lateral quadrants were detected. The signs of bilateral lung carcinomatosis, pleural cavities free. In the abdomen no liquid was detected. Liver moderately enlarged, of regular structure. Gallbladder without concrements. 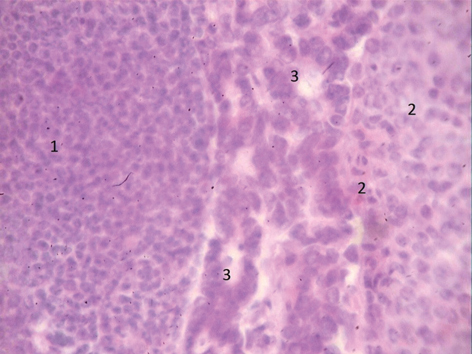 Pancreas, spleen, adrenals without pathologic changes. Uterus with a size of 55 × 40 mm, adnexa not enlarged. In parametrium small amount of liquid. In vertebral bodies no destructive changes were detected. Brain: no area of pathologic density were detected, midline structures are symmetric, subarachnoid space within normal. On December 22, 2015, the patient was treated by repeated surgery: removal of skin graft with subcutaneous fat and dermal neoplasm and extirpation of lymph node at the level of left axillary area. Histological conclusion from 29.12.2015 № 15CSD34744: in lymph node of skin graft in separately examined lymph node from left axillary area — melanoma metastases from epithelioid cells with moderate pigmentation and moderate mitotic activity. Then core needle biopsy of tumor-like neoplasm in upper-lateral quadrant of left breast was conducted. 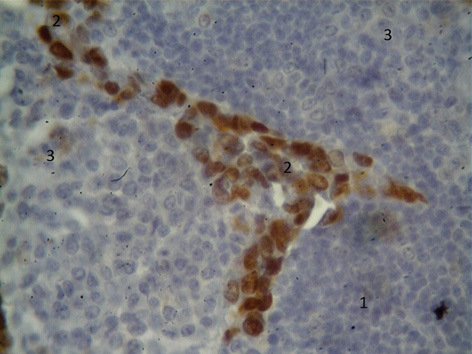 Histological conclusion from my canadian pharmacy 29.12.2015 № 15CSD34052: invasive duct carcinoma G1 of mammary gland, by the results of immunohistochemical study — of luminal B subtype: ER “+++”; PR “+++”; HER2/neu “—”; also, 20% of tumor cells were positive for expression of proliferation marker Ki-67. So, based on abovementioned results, the final clinical diagnosis was established: multiple primary synchronous tumors — dorsal skin melanoma pT2bpN2M1pulm; invasive multicentric ductal cancer G1 pT2(2)pN1pM0,Lum B in left mammary gland; prolongation of tumor process, metastasis of melanoma in skin and lungs. In 2016 the patient has been treated with 6 courses of dacarbasine (1660 mg) at monotherapy regime, and hormonal therapy with letrozole (2.5 mg daily) for 6 months, after which there were registered stabilization of melanoma and regression of breast tumors by 25%. In conclusion, the described clinical case of multiple primary tumors demonstrates on the possibility of metastasis of two tumors of different genesis and different primary localization — melanoma and breast cancer — in one lymph node, that is evidenced by the results of complex clinical and X-ray exam of the patient as well as the data of morphologic and immunohistochemical study of the surgical material — dorsal skin and axillary lymph nodes. By the disease anamnesis, we could not determine which one of the tumors was the primary one as well as the causes of their development. Such problems often arise in the cases of multiple primary cancers, so these pathologies require further studies. Warren S, Ehrenreich T. Multiple primary malignant tumors, a survey of the literature and statistical study. Am J Cancer 1932; 16: 1353. Abdurasulov DM, Nikishin KE. Multiple primary tumors. Tashkent: Meditsina, 1977; 112 p. (in Russian). Bylrot T, Vinivrater A. General surgical pathology and therapy: manual for doctors and students. Novatskiy AM, ed. 1980; 221 p. (in Russian). Oncology. National Manual. Chissov VI, Davydova MI, eds. Moskow: TESTAR-Media, 2008; 537–8 (in Russian). Bokhman YaV. Multiple primary malignant tumors. In: Manual of Oncogynecology. Moskow, 2002; 47–59 (in Russian). Blatt J, Olshon A, Gula MJ, et al. Second malignancies in canadian pharmacy practice journal very-long term survivors of childhood cancer. Am J Med 1992; 93: 57–60. Gueniot CH. Maladie de Hodgkin second cancer et deuxieme sexe. J Int Med 1993; 282: 16–7. Vyas JJ, Desai PR. Multiple primary cancer. Ind J Cancer 1981; 18: 118–22. Goncharenko GV. Primary multiple malignant tumors of most common localizations — statistical data of polyclinic cancer department. Res Pract Med J 2015; 2: 59–65 (in Russian).